One-pot Greek Baked Chicken Orzo: Perfectly seasoned chicken, nestled into a mixture of tiny orzo pasta with onions, bell peppers, and tomato. This is a dinner for any night of the week. Easy, and absolutely satisfying. I’m in love! This is a story about chicken dinners. The most trusted of weeknight meals ever! And likely the most comforting. Who doesn’t love a perfectly crispy roast chicken? 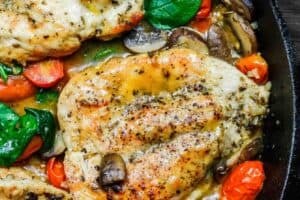 Or a quick skillet chicken slathered with garlic and Dijon? I tell you, you can do wonders with chicken! 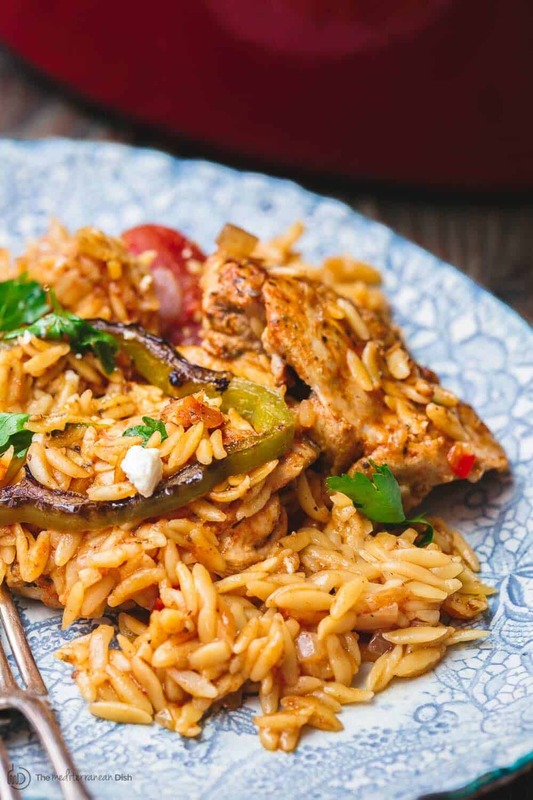 And to me, chicken is even more special when you turn it into a satisfying one-pot meal like my earlier Middle Eastern Chicken and Rice; this Greek Chicken and Potato Dinner; and of course, my newest obsession, today’s Greek Chicken Orzo! 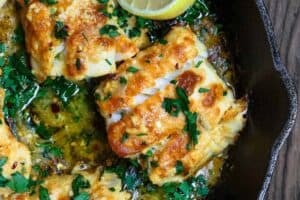 Why this Greek Baked Chicken Orzo Recipe works? 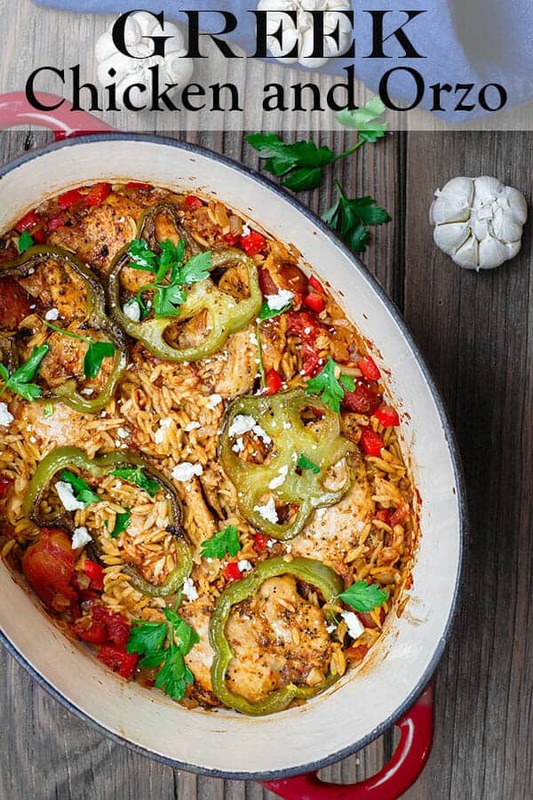 Admittedly, this one-pot chicken orzo recipe is not necessarily a traditional Greek recipe. 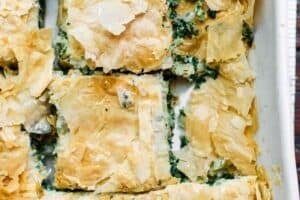 Oh, but it so does have all the comforting Greek things we love. 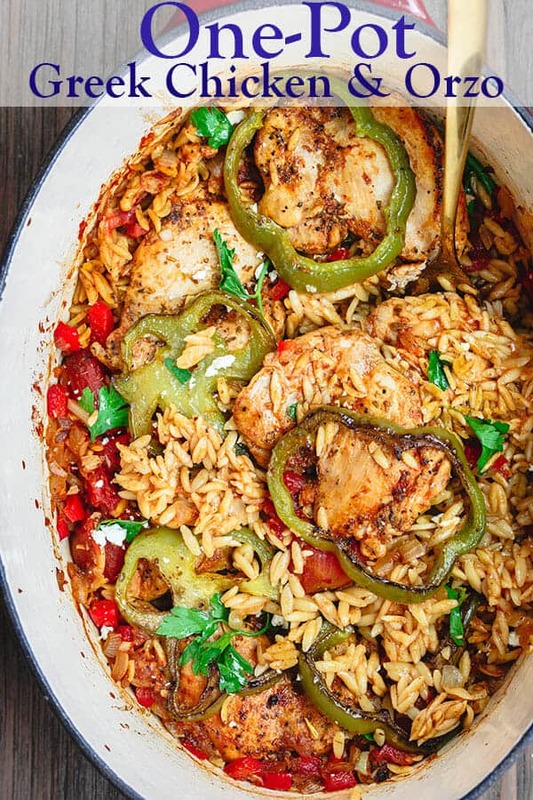 This baked chicken orzo has it all! Quick-marinated boneless chicken nestled in a mixture of tiny orzo pasta with tomatoes and bell peppers. Of course, as you would expect, layers of flavor from onions, garlic, and a few spices. As cliche as this sounds, a sprinkle of feta cheese, just before serving, completes this chicken orzo for me. 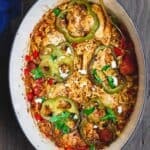 What to serve with this Greek Chicken Orzo? When I made this the other night, all I added as a side was a bowl of my lazy Mediterranean salad. After all, the idea of a one-pot dinner is fewer dishes, of course! But, you can also try roasted garlic hummus and a side of Balela salad, if you like. 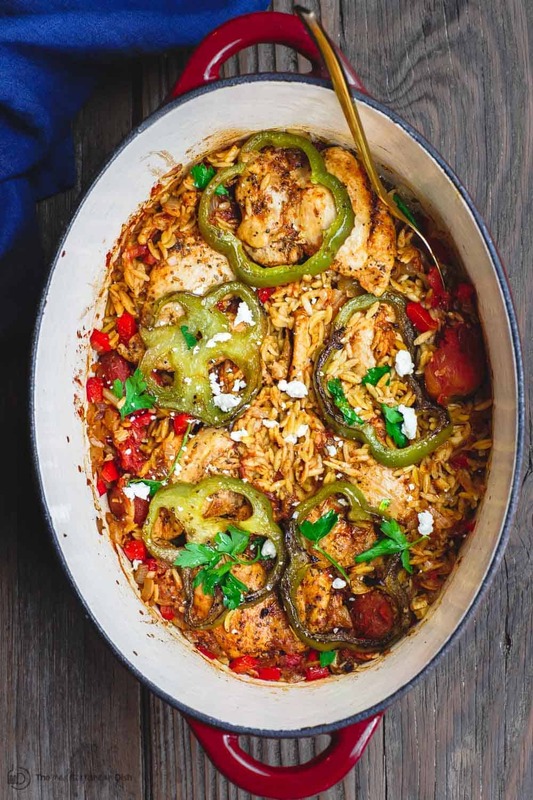 Easy one-pot Greek Baked Chicken Orzo! Perfectly seasoned chicken, nestled into a mixture of tiny orzo pasta with onions, bell peppers, and tomato. All the comfort. When ready, in a 5-quart Dutch oven like this one or a large oven-safe pot, heat 2 tbsp extra virgin olive oil over medium-high until shimmering but not smoking. Add chicken and brown the chicken on both sides (about 8 to 10 minutes). Remove chicken pieces to a plate for now. In the same pot, add green bell pepper slices and sear on either side. Remove and place with the chicken for now. If needed, add another tbsp extra virgin olive oil. Add chopped onions and red peppers, cook for 5 minutes, stirring regularly, until soft. Add garlic, and cook another 30 seconds, then, add plum tomatoes, broth, spices, and a dash of kosher salt and pepper. Bring to a boil, then add the orzo pasta. To serve, consider adding a side of this easy Mediterranean salad or this Balela salad. A plate of roasted garlic hummus or this roasted red pepper hummus would make a great starter, if you like. 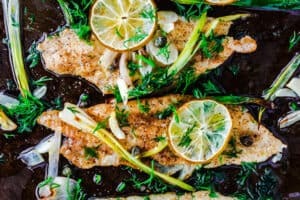 Recommended for this recipe: Private Reserve Greek extra virgin olive oil (from organically grown and processed Koroneiki olives); and from our all-natural and organic spice collections: sweet paprika, and coriander. SAVE! 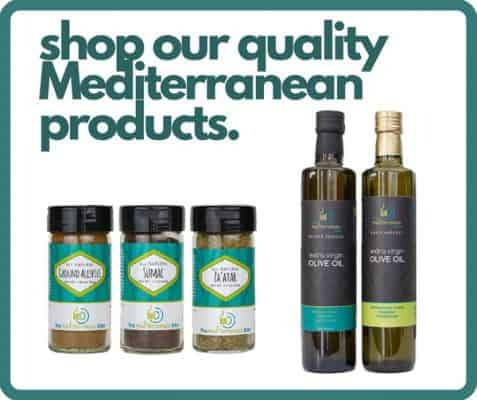 Try our Greek Olive Oil Bundle and our Ultimate Mediterranean Spice Bundle. Or create your own 6-pack or 3-pack from our all-natural or organic spice collections. thanks for sharing your adjustments, Janice! Very helpful. Glad you enjoyed it! Made this according to recipe. It was a big hit, simply delicious. Paired it with Balela salad. What a great meal. will make this again. Amazing!! So flavorful and easy to put together. I don’t have a cast iron skillet so I used a regular skillet and transferred everthing to a backing dish. I halfed the recipes, as that was all the chicken I had – turned out great. Will definitely do a full recipe next time, as the leftovers are great too!! Making this sun it looks amazing! However I am not a huge fan of tomatoes. I only use small chopped tomato’s when they will cook down alot and are needed for the flavor. Does the orzo need the tomato juice for flavor? It says 2 cups canned so I wasn’t sure if that was just the tomatos or the juice as well for flavor. If not I may use artichokes instead of tomatoes! Hey Heather, sorry I’m just now able to get to your question. But yes, the tomatoes and their juices are needed here to help cook the orzo and impart flavor. They won’t overwhelm at all though. This looks amazing! Can I make it ahead and reheat? Hi Kari, yes, you can make this ahead and reheat. Bring to room temperature if you can so you don’t have to leave it in the oven too much. I’d add a little liquid if needed. Heat in medium-heated oven. Can I use chicken with the bone in? Hi Sue, so bone-in chicken will take longer to cook. 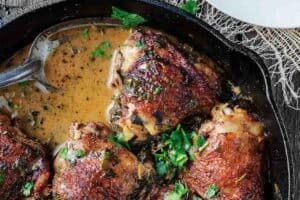 To use bone-in chicken, you may cook them first for a bit, then add them in with the orzo before you bake.